A hairy coat covers the squat body of this mount. 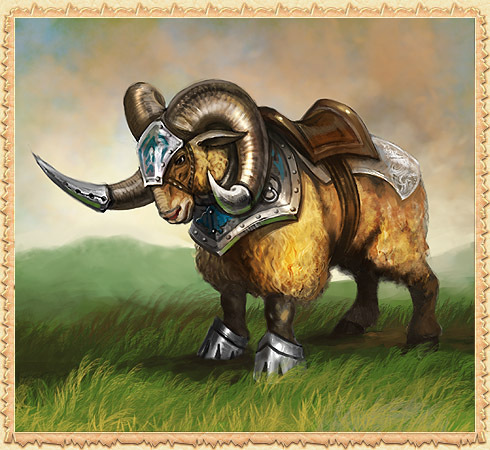 His head is crowned with powerful arc-shaped horns, the force of which cannot be resisted by any enemy. Used the fighting among his own, the Arhas is always ready for battle, to protect his owner and prove his own superiority over an enemy. The beast has great stamina and strength. It can carry you quickly over valleys and rocky areas: The Arhas can easily handle narrow mountain trails and can jump over the deepest gorges. It is obstinate and stubborn: it will take some time to tame it and earn its trust.